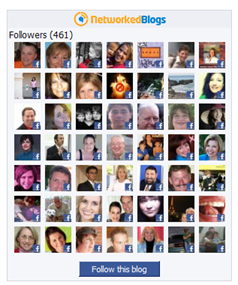 Have you customized your Facebook page? There are thousands of apps that can help you engage with your fans. In this article I’ll focus on the top 75 Facebook apps. However, there are literally tens of thousands from which to choose. Even clicking on the Business category as I’ve done in the screenshot above, we get apps like Bartab (send friends real drinks for $1) and Hugs and Hearts. I don’t know about you, but these are hardly business apps in my opinion! There’s also Appbistro where you can browse their comprehensive directory of apps for businesses. Now that Facebook nixed the ability to have our own custom content/apps on the Wall tab (left column), we need to get even more creative to ensure content on tabs is actually seen and that your fans interact with it; otherwise there’s not much point in having a dormant app that doesn’t enhance the user’s experience. However, it may be that very few of your tabs get much visibility except the actual Landing tab (my top scorer in the screenshot above). Your Landing tab is the default page that visitors see who have not yet joined your page (click Edit Page > Manage Permissions > select Default Landing Tab). So, my recommendation is to focus on those apps that actually publish content to your own Fan page stream (your page wall and the News Feed of your fans). Plus, add a few apps that allow for heightened engagement at specified times, such as live streaming video and live chat apps as I’ve detailed below for you. We ran an A/B test just four weeks ago to guesstimate the efficacy of a landing tab. We drove visitors to the fan page of a major brand using ads. Those ad-driven visitors converted to fans at a rate of approximately 47% WITH a landing tab. When we turned off the landing tab, those same ad-driven visitors converted to fans at approximately 23%. A VERY noticeable loss in conversions over the course of the campaign. The most popular app by far to add your own custom content has been Facebook’s own Static FBML. Facebook will be replacing all FBML tabs and apps with iFrames at the end of 2010, at which time you’ll be able to create custom tabs using iFrames. However, Facebook will continue to support any and all tabs/apps created prior to when FBML gets deprecated. See the Developers Roadmap for updates on the timeline of changes. 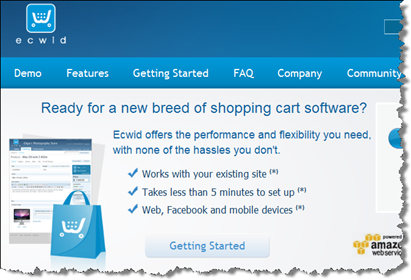 Static FBML – you’ll need to be familiar with coding or use a WISIWYG editor first. 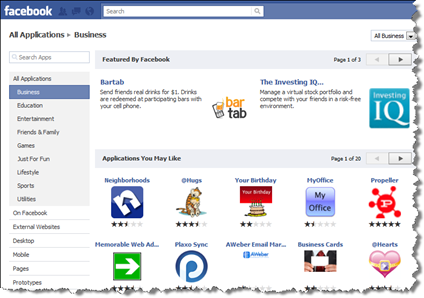 See Tabfusion’s Free Facebook Page Tab Maker here. Plus, review these two helpful tutorials. 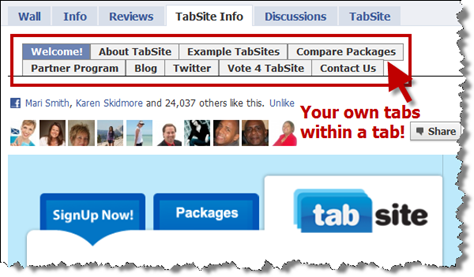 TabSite – free version with two TabSite subpages or choose from three paid levels. Complete WISIWYG editor; tabs within a main tab. TabSite is one of my favorites. It’s a very easy-to-use interface. 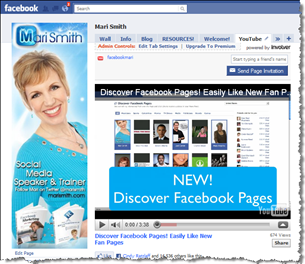 I created the “RESOURCES” tab on my Facebook page using TabSite. Static520 – UPDATE 12/21/10 – some users have reported this app provider is not working properly. FaceItPages – UPDATE 12/30/10 – added this provider to the list. For a helpful review of some of these apps, see this post on TechCrunch. Plus, read Jay Baer‘s review of several of these apps here. For a list of over 50 Facebook-approved developers, go here. See the complete list of Facebook Preferred Developer Consultants here. Once you’re happy with your custom Landing tab, it’s time to import your blog’s RSS feed. 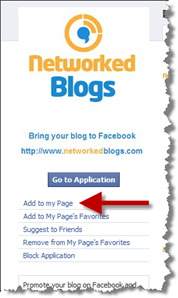 My favorite app – used widely by many bloggers on Facebook – is Networked Blogs. It’s free and relatively simple to set up. 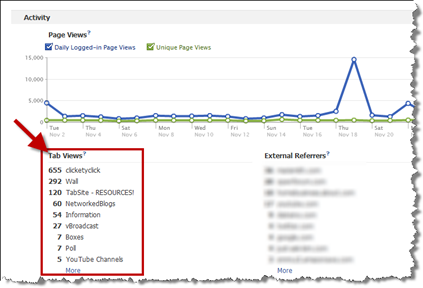 Once you’re set up and have a few followers, you can place the Networked Blogs widget on your blog for added visibility. Any time you have the chance to display your fans’ faces, go for it! Facebook’s Notes app (can be a lag time and is sometimes buggy). 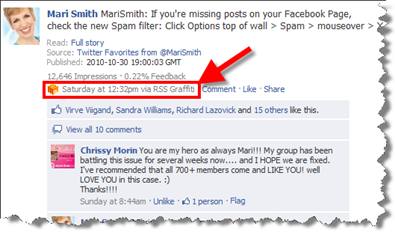 Any of the RSS apps; e.g., RSS Graffiti, Social RSS or others. You can easily import any of your content that has an RSS or Atom feed. For example, I import my Twitter favorites and Google Reader Shared Items using the RSS Graffiti app. 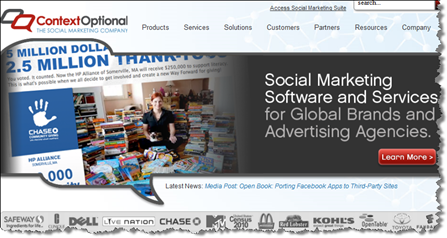 Objective marketer (complete publishing platform – used and recommended by Guy Kawasaki). I’ve been searching for some time for the ultimate YouTube app – one that automatically publishes new uploaded videos from your channel to your Facebook page wall, has a nice-looking tab, is easy to navigate and doesn’t take users away from your Fan page to view videos. Plus, if I were really waving a magic wand, I’d love it if YouTube gave us the option under their “Activity Sharing” feature to post liked or favorited videos to our Fan page (versus profile). The closest I’ve found is YouTube Channels – I like their interface but the downside is they charge a monthly fee of $4.99 and I couldn’t get the Publish to Wall feature to work, so I canceled my subscription. 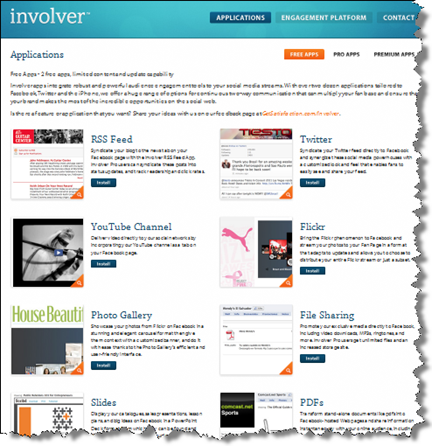 Check out the YouTube Channel app by Involver (screenshot below) or the YouTube Video Box app. If you have a Viddler account instead of or in addition to YouTube, check out the Viddler app. Selective Tweets – once set up, this app allows you to post your tweets to your Facebook page simply by including “#fb” at the end of the tweet (or there is an option to include #fb anywhere in the tweet but I don’t recommend that option as it’s too easy to make a mistake!). You can choose to post tweets to your personal profile and/or Fan page. Another Twitter solution is to simply install an app that pulls in all your tweets onto a tab, but doesn’t publish in the stream. I’m not sure there’s much benefit to this, as I say the primary goal here is to get into the News Feeds of your fans. 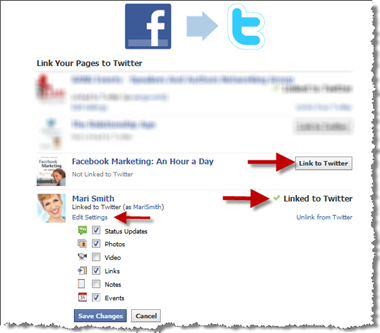 To publish your Facebook content TO Twitter as tweets, connect your page using Facebook’s own Twitter app. You have a choice of six different types of content: Status Update, Photos, Video, Links, Notes and Events. Facebook’s publisher (the field where you type your updates) takes up to 420 characters; whereas tweets are 140 characters. With this Facebook to Twitter app, your content will automatically be truncated with a link back to your Facebook page which can help increase engagement by bringing your Twitter followers onto Facebook. To display photos from your Flicker account, you might want to try the Flickr Tab app. See also the suite of app providers above. 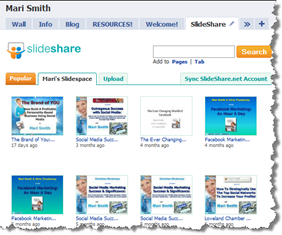 If you have slides up on SlideShare, display them on your Facebook Fan page! You’ll have a nice display on the SlideShare tab, but I haven’t found that adding new slides automatically publishes to the wall. 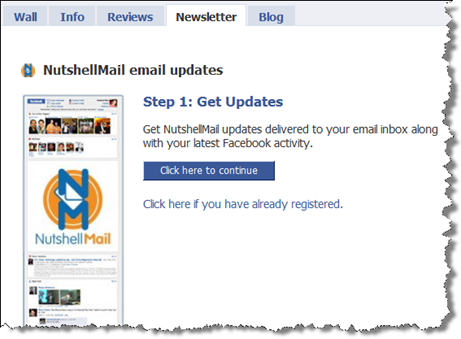 So, as you add new slides (and/or videos) to SlideShare.net, also publish the URL right on your Facebook page wall. What this does is pull in an actual player very similar to the video player with the blue play button icon. Your fans can play the slideshow right on your wall, and of course like and comment, providing that coveted News Feed ranking. Facebook has a Reviews app that you can add to your Fan page. The cool thing about this app is whenever a fan writes a review, it goes out into their stream (their wall and friends’ News Feeds). If you have a particularly negative review, spam or trolls, unfortunately there’s no way to remove individual reviews. If that ever happens, you could remove the app altogether. Otherwise, I think the Reviews app is an often-overlooked goldmine for businesses to have on their Fan pages! Read my review here from when I beta-tested the app for Vpype. 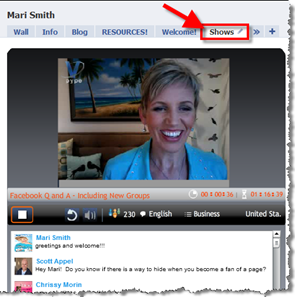 Along with offering impromptu or scheduled live video broadcasts, you could also offer live chat sessions with your fans. One such app I’ve tried and like is Clobby. The one downside of this app is the obnoxious banner ad at the top of the chatroom as you can see in the screenshot below. However, simply scroll the page down enough to hide the banner while chatting. Whenever you open your chatroom, you can publish an announcement to your Fan page wall, which of course goes out in the stream and fans start coming over to chat. 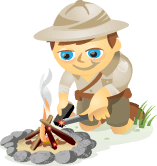 Publish a tweet as well to get even more people in the chatroom! You could host a regular live chat for your fans; I suggest capturing the chat stream with an app like ScreenFlow for Mac or Camtasia Studio for Mac or PC – that way, you have an archive to refer to. 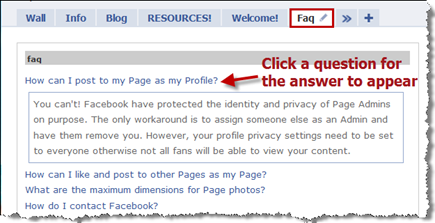 If you find yourself continually answering the same questions for your clients and community, be sure to compile a Frequently Asked Questions section – the simple FAQ Page app allows you to have an FAQ tab on your Fan page that you can direct fans to when answering questions on your wall. A couple of things to note about this app: you can’t reorder the questions once inserted, so you may wish to compile your FAQs and all their answers in a separate document before pasting each one in. Also, it would be great if each question had its own unique URL so you could just share the link in answer to questions on your wall, but this isn’t the case. For a poll or quiz app to work well, you want your fans to quickly and easily participate and for that activity to spark more engagement and visibility. If users have to jump through extra hoops to participate, they’ll likely just move on. 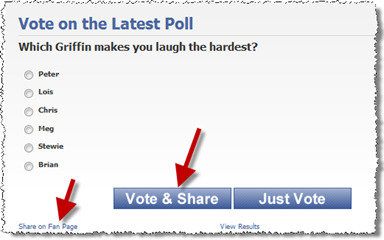 This screenshot shows the Fan Appz poll app live on the Family Guy Fan page – I like how the app provides the option for voters to share (on their personal profiles) and also to share on their Fan pages! 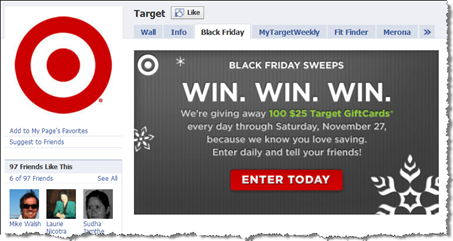 Facebook’s rules around contests, drawings, competitions and sweepstakes are rigorous. Though many Facebook users are either unaware of the rules or choose to ignore them, I personally feel it’s not worth the risk to administer a promotion of any kind that doesn’t adhere to Facebook’s rules. In one fell swoop, you could lose your carefully built Fan page. With the boom of LBS (Location-based Services), local business have more ways to integrate social and mobile media than ever before. 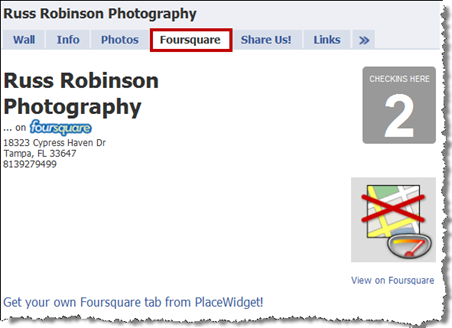 Why not show off your Foursquare customer check-ins with an app on your Fan page? Plus, be sure to claim your Facebook Place page: just search for your own business name on Facebook and look for the link at the foot of the Place page that says “Is this your business?” Once claimed, you’ll have the opportunity to merge your Place page with your Fan page. The resulting new page looks rather different, so think carefully about this. (For examples of merged pages, take a look at Iron Horse Vineyards and The Ellen Show). 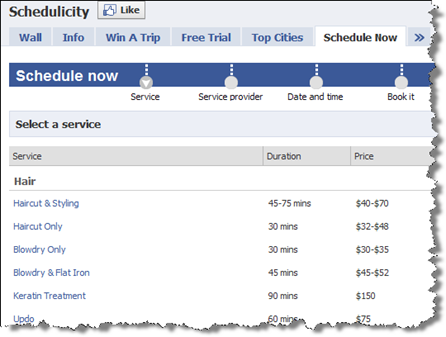 Make it super-easy for your Facebook fans, clients and prospects to book time with you. Add a tab synched with your appointment scheduling platform of choice. Remember, each tab has its own unique URL; you can easily direct your fans to your appointment tab. 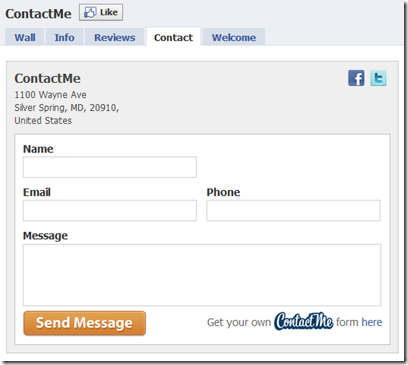 See this helpful post by Tim Ware at HyperArts with a review and tutorial on JotForm and Allforms. See also this related blog post on Social Media Examiner: How to Sell Products via Your Facebook Page. What do you think? Do you use any of these apps? What has been your experience? Also, have I missed any Facebook page apps you’ve tried successfully? Please add your comments in the section below.